Refrigerant is usually measured in weight and in liquid form. This is the state most refrigerants are in when in a pressurized container. On a simple water chiller cooling system you will find the liquid refrigerant within the condenser. When the compressor starts, the top of the condenser starts to get hot and the pressure will rise. The liquid at the bottom of the condenser will be forced through the inline refrigerant filter and then through the expansion valve. Because the valve has a small orifice, there will be a lower pressure after the valve, caused by the suction side of the compressor. This causes the sprayed (atomised) liquid refrigerant to boil off (evaporate). It’s a bit like filling a cigarette lighter with gas, the lighter gets cold as the gas is allowed to expand into a less pressurized container, as it expands it evaporates causing it to get cold. The roll of the expansion valve is to meter this liquid according to the amount of medium passing over the evaporator. Too much liquid and you will flood the evaporator causing compressor damage, too little and you will lose chiller performance and cause the compressor to over heat (the compressor is cooled by the evaporated refrigerant from the evaporator). The expansion valve will meter liquid refrigerant within its range. This range is the chiller manufactures recommended medium flow rates, ambient conditions and temperature of water in and out of the cooling unit. If any of these recommended conditions are over looked the result could be disastrous. For example if you are running your unit down to say 4oc, your water inlet and outlet are 8oc apart, the chiller controls on inlet temperature then you may have water leaving at -4oc! This could freeze the evaporator and cause the evaporator to split thus virtually writing off the system in repair bills. Most chillers have an antifreeze alarm that will prevent this (if the setting is checked that is). Glycol (antifreeze) would prevent the evaporator splitting but the unit would still be running out side of its design, causing liquid to flood the evaporator and cause the compressor to fail. One of our customers was experiencing this very situation before they signed up ICE to rectify their problems. His unit was a Trane chiller and the evaporator had iced up and split. The outlet temperature sensor was reading a higher reading so the chiller ignored the antifreeze set point alarm causing the evaporator to split. This caused the refrigerant to enter the water side and water to enter the refrigerant side causing the compressor to fail. The company he used for the repairs ordered a new compressor without realizing the evaporator had split. They replaced it , the new compressor then went down within 2 hours. They ordered a new compressor on an overnight delivery from abroad and fitted it, this went down again. The customer booted the contractor off site and called us, the chiller was a right off! We sorted his problem by installing a bespoke system that we could replace any part without shutting down the whole system, it is still running 6 years later. 1. A blocked water filter. 2. Faulty water pump (impeller slipping or broken). 3. Too much Glycol (viscosity, to thick reducing flow rate and chiller duty). 5. Incorrect size pipe work. 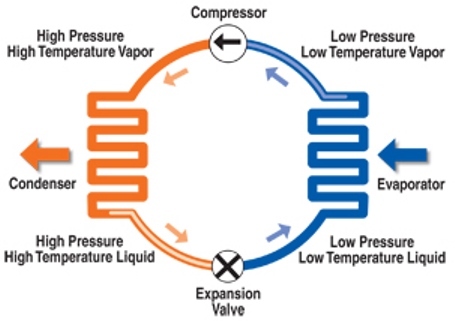 valves and cooling system designed without a pressure relief bypass or any type of bypass). 8. Lack of water in the system. 10. Obstructions in the pipe work (I have even seen rats stuck inside newly installed pip work). importance of a service provider! If we can be of any assistance please contact us on our link below. Call Today! We have a highly experienced team of engineers available to solve any cooling system problems that you might be experiencing.